Delegate: Mr. Peng Wei , National Ocean Technology Center, SOA. In 2018, the mid-term evaluation about “the 13th Five-Year Plan for Marine Renewable Energy (2016-2020)” was conducted by the Ministry of Natural Resources (MNR). The Ministry of Science and Technology (MOST) released the National Key Research and Development Programme ‘Renewable energy and hydrogen energy technology’ to support the R&D of ocean energy. The new round of Special Funding Programme for Marine Renewable Energy (SFPMRE) was initiated, and 2 demonstration projects were funded. Some new tidal current turbines were deployed in 2018. The mid-term evaluation about “the 13th Five-Year Plan for Marine Renewable Energy (2016-2020)” was conducted by the MNR in 2018, and the National Ocean Technology Centre is responsible for the implementation of the mid-term evaluation. “the 13th Five-Year Plan for Marine Renewable Energy(2016-2020)” was released by State Oceanic Administration(SOA) in December 2016. The overarching vision of the Plan is to i) Promote the demonstration and application of marine renewable energy, ii) Focus on the breakthroughs in key technologies, iii) Improve the technology levels of marine renewable energy, iv) Strengthen the construction of public service platform, and v) Foster international cooperation in development of marine renewable energy”. By 2020, the total installed capacity of marine renewable energy will be more than 50 MW in China. The new round of Special Funding Programme for Marine Renewable Energy (SFPMRE) was initiated. In 2018, a total budget of RMB 79 million was granted for 2 marine renewable energy demonstration projects, the 1 MW Zhoushan tidal current energy demonstration project and the optimization and application of a highly reliable MRE system. The special funding programme has invested above RMB 1.3 billion since 2010 and 115 MRE projects were funded. The Ministry of Science and Technology (MOST) released a draft of the National Key Research and Development Programme ‘Renewable energy and hydrogen energy technology’ for public review in March 2018. There were 2 MRE tasks in the programme, task I “Research on MRE resources characteristics and high-efficiency energy conversion mechanism” and task II “Research on MRE key technology and equipment”. The programme will provide the funds which are applied to research projects. The application of task I was started in 2018, a total budget of RMB 23 million will be granted for task I and task II will be started in 2019. In 2015, the Guangzhou Institute of Energy Conversion (GIEC) successfully developed and built the 100kW prototype of Sharp Eagle “Wanshan”. The device is 36m×24m×16m, and weighs 1,000 tons. It’s a floating power station. The device was deployed near Wanshan Islands for sea trial in November 2015. The device realized intermittent power generation in small waves of 0.5 meters and safe power generation in large waves of 4 meters, and the total conversion efficiency reached above 20%. In April 2017, Sharp Eagle “Wanshan” was connected to the grid on Wanshan Island. In December 2017, supported by the Chinese Academy of Sciences (CAS) and China Southern Power Grid, the upgrade of 260 kW wave-solar-storage-desalination offshore floating energy platform "Pilot 1" based on Sharp Eagle technology was completed (Installed wave energy 200 kW, Installed solar energy 60 kW, a desalination facility with daily production of 6 tones water). The 260 kW "Pilot 1" offshore floating energy platform deployed for open sea test in January 2018 and was successfully connected to the remote island power grid through submarine cables in Hainan province on 31 August 2018. 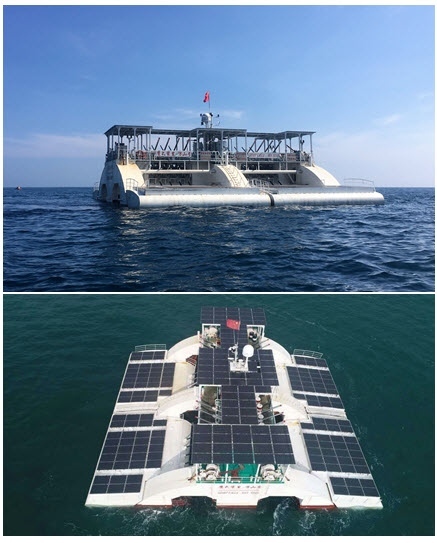 In order to solve the situation of shortage of energy supply and poor wind-wave resistance of traditional aquaculture cages in China, the GIEC combines Sharp Eagle wave power generation technology with aquaculture, offshore tourism, science popularization, using wave energy to power the integrated platform of aquaculture, tourism, science popularization. The GIEC has applied patents for the integrated platform technology for aquaculture powered by wave energy and tourism in China, the European Union, Japan and Canada. Construction of the first prototype began in December 2018, and it is expected to be completed in June 2019. 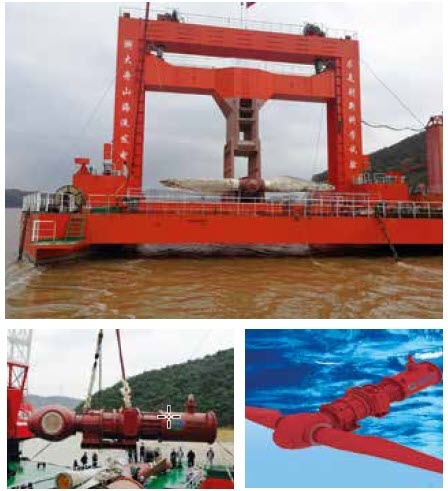 Sponsored by SFPMRE and the MOST, the Zhejiang University invented a series of tidal current energy turbines. The 60 kW tidal current energy turbine was deployed in 2014. The 120 kW semi-direct drive H-axis turbine was deployed in 2015. And the Zhejiang University deployed a 600 kW horizontal axis turbine in 2018. This is the third turbine, after the 60 kW and 120 kW sea trials, cut in current velocity: 0.7 m/s, rated current velocity: 2.5 m/s. Sponsored by SFPMRE, the Guodian United Power Technology Company Limited (United Power) is developing a new 300 kW H-axis turbine. The turbine has been deployed near Zhairuoshan Island for sea trial and connected to the grid since March 2018, generating 288 MWh until November 2018. Cut in current speed: 0.5m/s, Rated current speed: 2.0 m/s, Maximum conversion efficiency: 40%, Support structure: Floating. Supported by the SFPMRE, the Hangzhou United Energy Co. Ltd. is developing the LHD Tidal current energy demonstration project. The #1 demonstration platform was deployed near Xiushan Island in March 2016. They plan to install 7 turbines in their platform, with installed capacity of 3 400 kW. 2 turbines (600 kW, 400 kW) were installed on the platform in July and connected to the grid in August 2016. The amount of electricity accumulated was more than 1GWh until December2018. In 2016, Hangzhou United Energy Co. Ltd. was funded RMB 45 million by the SFPMRE to develop new 300 kW h-axis turbines and a new 400 kW v-axis turbines. The turbines were deployed in December 2018; the capacity of LHD project reached 1.7 MW. In 2018, LHD was funded RMB 72 million by the SFPMRE to press ahead with the next phase project, including (4.1 MW) #2 platform and a 1 MW V-axis turbine. Three turbines will be installed on the #2 platform, the full capacity of LHD project across all phases will be up to 7 MW. In 2018, the Zhejiang University (ZJU) installed a 600 kW tidal current turbine on the platform near the Zhairuoshan Island (with 60 kW turbine already deployed in 2014 and 120 kW turbine deployed in 2015). In the future, the platform will serve as a testing platform for tidal current energy turbines. Sponsored by SFPMRE, NOTC developed the mobile test system for MRE device (Including power test system, monitoring system, data communication system and comprehensive evaluation system). The test system can provide test service such as power quality and power characteristic of MRE power system for MRE developer. Based on the previous wave energy research, the SFPMRE supported the construction of China's first MW-level wave energy demonstration farm in July 2017. Led by GIEC, it is jointly undertaken by other 6 units, including China Southern Power Grid and China Merchants Heavy Industry Co. The total project budget is RMB 151 million. It aims to use Sharp Eagle wave power generation technology developed by GIEC to build a MW class wave energy demonstration farm on Wanshan Island. It will make Wanshan become an important base for intensively displaying wave energy technology in China, and popularize and apply Wanshan technology to other islands in China. The design for construction, PTO system and mooring system was finished, the manufacture began in December 2018 and will finish in October 2019. Marine Spatial Planning (MSP) is used as a decision making tool: every project relating to the sea must conform to the Marine Functional Zoning. In 2012, the State Council approved the National Marine Functional Zoning (2011-2020), and eleven planning of provinces, municipalities and autonomous regions. China started the Marine Functional Zoning work in 1989. Marine Functional Zoning is zoned in 8 categories: farming fishery area, port, shipping area, industrial and urban area, mineral and energy, touristic area, marine protected area, special use area and reservations. Pre-selected areas for ocean energy development have been defined, under the category “mineral and energy”. Site selection planning should be consistent with the National Renewable Energy Development Planning, Marine Functional Zoning, Island Protection Planning and Marine Environmental Protection Planning. • Energy Management Departments – responsible for reviewing the energy assessment report. • For power production and grid connection a specific permitting procedure is required which involves the utility distribution grid operator. There is no specific authority responsible to manage the ocean energy consenting process as a whole (“one stop shop” facility or entity). The approval departments depends on the funding sources for the project. An EIA must be submitted to the State Oceanic Administration and related Environmental Protection Departments. The responsible for the decision on the requirement for an EIA are the Environmental Protection Departments. A “Marine Engineering Environmental Impact Assessment Technical Guideline” is available for developers, as well as related environmental protection standards. EIA baseline and post-deployment monitoring of the projects are not done. • “Interim Measures for Renewable Energy Electricity Price Additional Income Allocation”. The formal mechanism of public participation consists in expert meetings to select the preferential developers. • National Marine Consulting Center – technical review of EIA documents. Informal consultation activities implemented during the licensing process can be on a sample survey form, panel discussion, feasibility study meeting, hearing, etc. and it shall include the representatives of citizens influenced by ocean engineering, legal persons or organizations. It is clear to applicants what permits are required, in what order and what information must be supplied at what time. Furthermore, there is guidance available to help developers during the process.